A new book, co-edited by Mary Ellen Konieczny, intends to start the conversation about the polarization in the Catholic Church through healthy debates and genuine engagement. 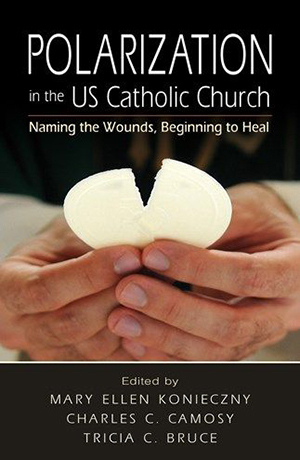 Konieczny, associate professor of sociology and Henkels Family Collegiate Chair at the University of Notre Dame, edited and contributed to a collection of essays titled Polarization in the U.S. Catholic Church: Naming the Wounds, Beginning to Heal (Liturgical Press, 2016) with alumnus Charles C. Camosy ’97 Ph.D. ’08 of Fordham University and Tricia C. Bruce of Maryville College. The book confronts issues U.S. Catholics tend to avoid debating, such as sexual orientation, abortion, and racism, and attempts to contribute to an environment for amicable discussion. Polarization in the U.S. Catholic Church grew from a conference of the same name held at Notre Dame in 2015 and organized by Konieczny, a faculty fellow at the Center for the Study of Religion and Society. Catholic priests, public intellectuals, theologians, and social scientists of diverse ages, races, and ethnicities gathered to discuss the divisiveness in the U.S. Catholic Church and how to spur reconciliation. Among the contributors are Reverend John I. Jenkins, CSC, president of the University of Notre Dame, and Most Reverend Daniel Flores, bishop of the Diocese of Brownsville, Tex. Authors explore the impact Millennials and a growing Hispanic population are making on the church. At the heart of the book is the point that there is still much that binds American Catholics together and that healthy engagement and dialogue are needed to heal many decades-old wounds.